This metal is actually a class of material that is rigid, non raveling and has been slit and expanded. During this expansion process the expanded metal will lose 80% of its weight but still retain strength. 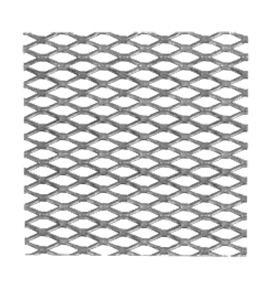 Most people refer to expanded metal as a mesh. There are numerous applications appropriate for expanded metal, but because of ventilation properties and visibility, most applications are for guarding of machinery and personnel. Expanded Metal parts can be made from steel, galvanized steel, stainless or alloy steel. Short Run Pro carries, as a standard, flattened metal of ½” #16 expanded. Flatten, expanded metal is a process where the metal is run through a mill to produce a flat and smooth surface. The ½” #16 flattened expanded metal is the industry standard for expanded metal and recommend in most machine guard applications. If specialty material is needed, such as galvanized or smaller opening (1/4”), Short Run Pro can provide it upon request. Lead-time may be extended based on material availability. All of the above are interchangeable names in the industry for a type of metal stock with a regular pattern of raised diamonds or lines. Diamond Plate usually refers to an aluminum product, while Tread Plate and Floor Plate usually refers to its steel counterpart. These plates are typically used in stairs or catwalks in industrial areas. The added texture reduces risks of slipping and many times the tread plate is used to cover cutouts in floors where wiring may be passing. Diamond plate is also used in decorative applications such as garages or shops. 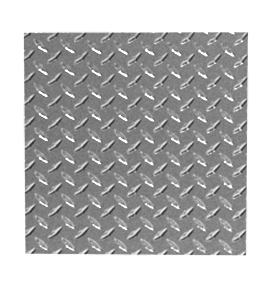 Steel tread plate is usually thicker plate form 3/16” to ¾”. This classification includes a broad range of metal materials that use round, square, slotted or decorative perforations. This metal product is used primarily as screens, diffusers, guards, filters, and vents. Short Run Pro stocks a 14 gauge 3/16-1/4 stagger steel perforated material. 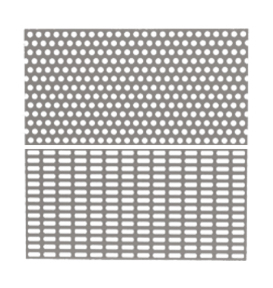 This is a general purpose perforated metal suitable for most applications. (3/16 describes the hole size and the ¼” describe the stagger from one row of holes to the next). There are numerous perforated configurations that are available.